In a previous post I wrote that by adopting certain gardening practices you can take advantage of “ecosystem services”, which provide pest control, healthy soil, thriving pollinators, and more. The goal is to strive for a balanced system where natural processes are encouraged and thrive. Why bother? In a healthy garden diseases and pests are minimized and you are contributing to the health of our environment overall. Here are my favorite tips for creating a thriving ecosystem in your garden. To keep it simple think of it this way: an ecosystem is made up of living things and all living things need the basics: food, shelter (a home, i.e., habitat) and water. In my garden a combination of California natives, ornamental plants (non-natives), and edibles make up a triad that buzzes with life. The native plants encourage wild pollinators and provide habitat and food. 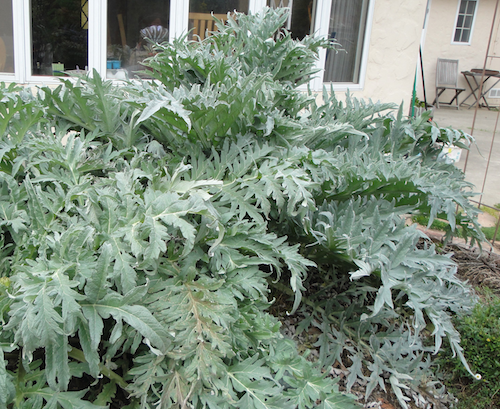 A careful selection of water-wise ornamental plants (a must in California) do the same. Edible plants are a diverse group that includes trees, herbs, perennials of many types, and annuals, which include many of our vegetables. In an ecosystem these plants have multiple roles. 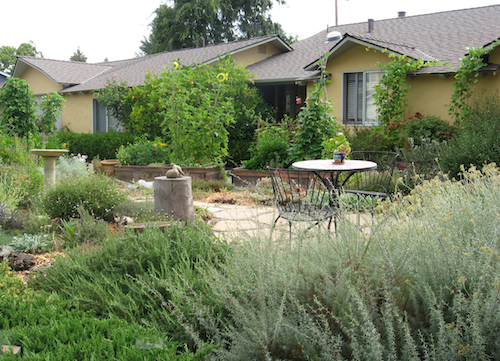 Most traditionally designed gardens in urban areas do not have all of the three components above. The typical lawn-centered garden that is overly manicured with nary a leaf out of place is generally not very biologically diverse. Urban and suburban gardens are often designed to minimize leaf litter and emphasize a significant monoculture of lawn space. All lawns are not necessarily bad, it's the practice of using weedkillers and synthetic fertilizers that do the most harm to the ecosystem, in addition to wasting copious amounts of precious water. Furthermore, the flowering plants in these traditional gardens are usually not allowed to form seeds, and they aren't selected for their value as food for wildlife. In fact, some hybridized flowers don't produce pollen (sterile hybrids), which is considered a messy drawback for cut flowers brought into the house! In short, the traditionally landscaped garden is low on diversity, and a healthy ecosystem is just the opposite. In my garden, a combination of California natives, ornamental plants (non-natives), and edibles make up a triad that buzzes with life. I didn’t follow a formula to arrive at this combination- it happened naturally during the process of redesigning our yards. 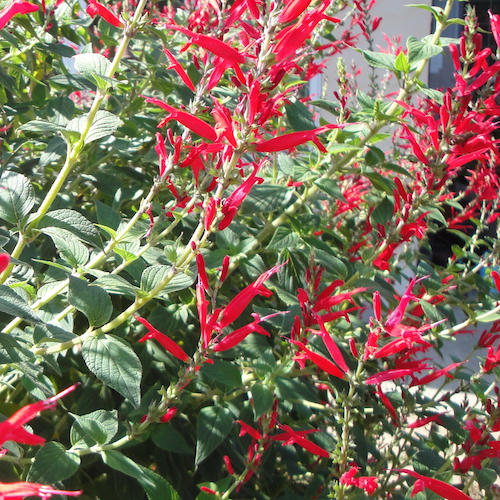 The native plants encourage wild pollinators and other beneficial insects, and provide habitat and food. 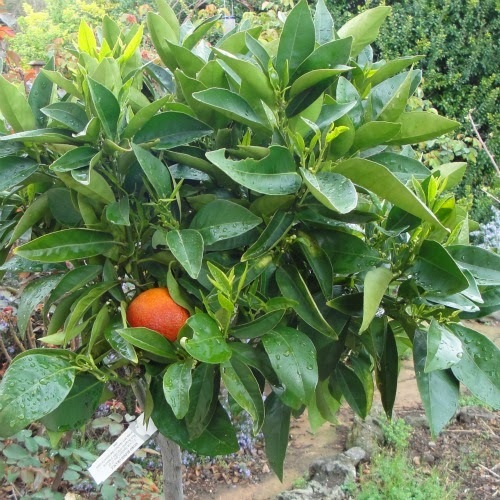 A careful selection of water-wise ornamental plants (a must in California) do the same, as do edible plants. 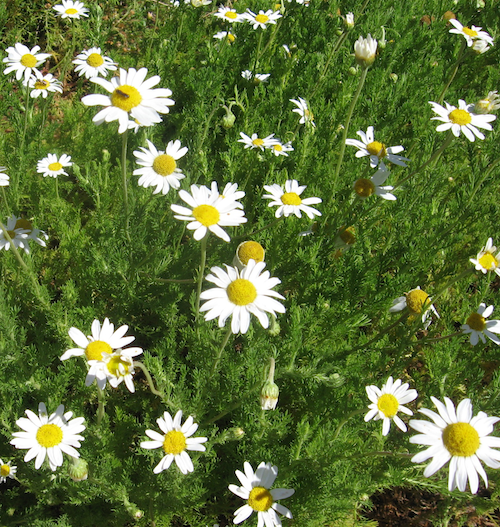 Among my edible plants I’ve included a variety of perennial culinary herbs that insects love. These herbs have low water requirements: oregano, sweet marjoram, sage, rosemary, winter savory, lovage and different thymes. Allowing them to flower is critical. Not only do they attract pollinators, they are essential for cooking (the flowers are edible too), and can be cut back periodically after flowering to renew their foliage. 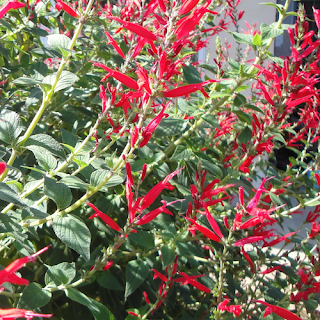 With these attributes they are popular in gardens for Mediterranean climates like ours in the San Francisco Bay Area. Herbs are planted around my raised vegetable beds as permanent companions to seasonal vegetables to maximize pollination and bring in beneficial insects. A mature tree is extremely valuable and not readily replaceable. They provide us with numerous benefits that we take for granted at our peril. A mature tree is an entire ecosystem that contributes (at a minimum) habitat for wildlife, shade, food, organic matter through leaf litter that feeds the soil as it decomposes, they transpire moisture into the surrounding air to regulate the local temperature, and their extensive root systems are part of the ecology of the soil food web. In keeping with my strategy of using natives, ornamentals and edibles, here are the trees in my garden: avocado, Meyer Lemon, a Blood Orange, Pomegranate, Santa Rosa Plum, a Pluot, a multigrafted apple, California Buckeye (Aesculus californica), Flannel Bush (Fremontodendron californicum), Coast Live Oak (Quercus agrifolia), and Crepe Myrtle (Lagerstroemia indica). Our shrubs provide a dense screen along our backyard fence and they are a favorite nesting place for local birds. They enjoy foraging on the ground where wood chips have replaced the lawns, and I provide water in two birdbaths for them. You can build your ecosystem over time as you learn more about the best plants to include for your climate zone. It’s a lifestyle choice and gradual process of discovery. 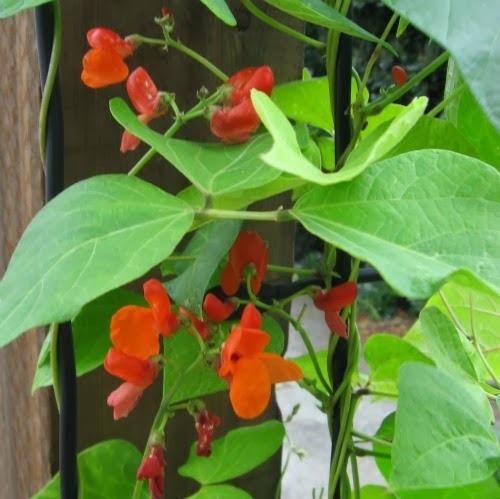 Select plants that have flowers and seeds attractive to the local wildlife. Remember that a healthy garden is lively with activity!